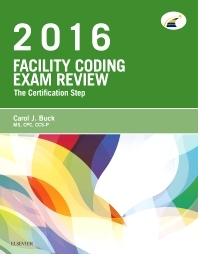 Prepare to succeed on your facility coding exam with Facility Coding Exam Review 2016: The Certification Step! From leading coding author and educator Carol J. Buck, this exam review provides complete coverage of all topics included on the facility coding certification exam — including anatomy, terminology, and pathophysiology for each body system; reimbursement issues; CPT, HCPCS, and ICD-10-CM/PCS coding (with ICD-9-CM posted on Evolve companion website); and more. Two full practice exams simulate the testing experience, include answers and rationales, and provide enough practice to reassure even the most insecure exam-taker. It’s the only facility coding exam review you need! Mobile-optimized quick quizzes provide extra practice and review with 300 additional medical terminology, pathophysiology, CPT, ICD-10-CM/PCS, and HCPCS questions. Comprehensive review content covers everything you need to know to pass the facility coding certification exam. Practice exams on the Evolve website allow you to assess strengths and weaknesses and develop a plan for focused study, including a Pre-Exam to be taken prior to studying, the same exam again as a Post-Exam to be taken after your review, and a Final Exam that simulates the experience of taking the actual facility coding exam. Colorful design and illustrations make your study and review easier and more engaging.